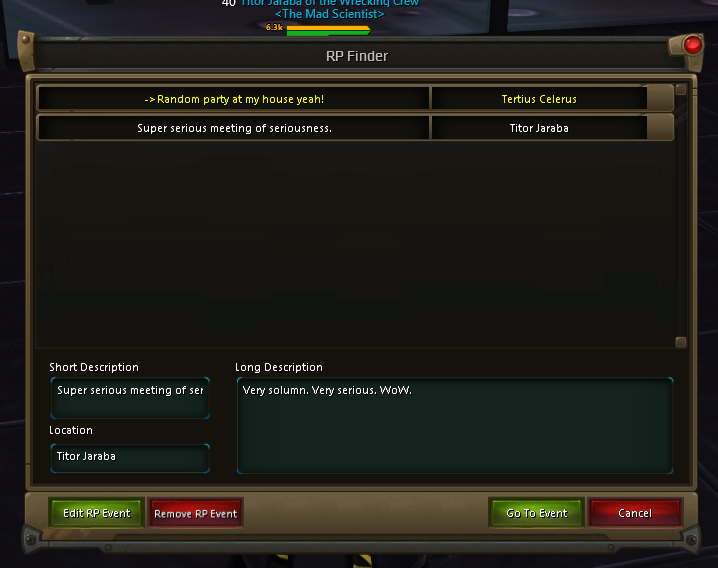 This idea is inspired by the party finder in FFXIV. It allows one to put up an event, as well as a location of the event. 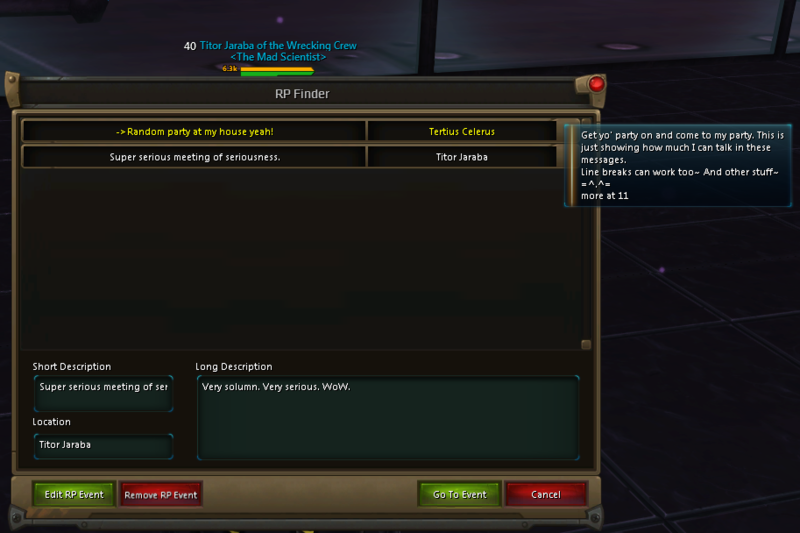 With one click, others can join your event if they are in a housing ward. 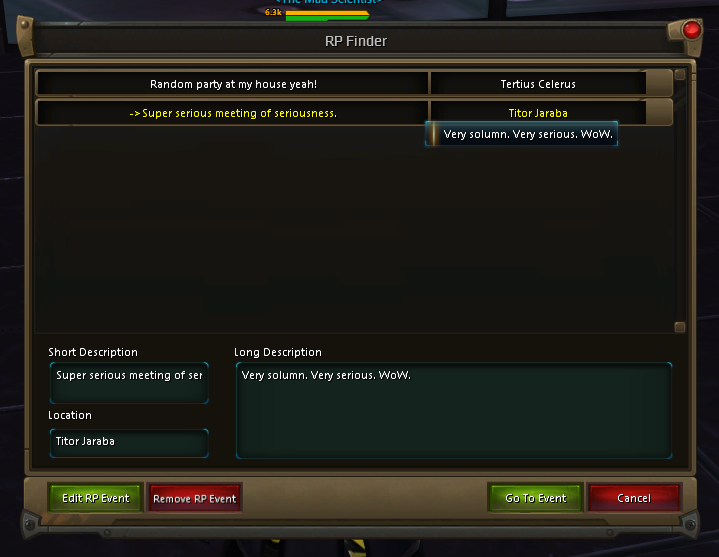 It is a way to show other RPers what events are currently going on, and are active, as well as where they are. If you would like to volunteer to help test, please contact me here. Testing would likely be done on the Dominion side of Entity. This is an -amazing- idea, my plots always open for RP but it would be great to slap a notification up when myself or some of the staff are there RPing without having to announce to the ooc channel every 30ish minutes. The screenshots make it look really easy to use as well! If I ever get my Draken to 14 I'll hit you up for testing. Next week, I'll have more time available to give it some test runs. I'll be happy to check it out. This sounds really awesome, and your screenshots shows a lot of great potential! This does sound really neat! This could really help improve RP event cordinations and such! Good concept. A few pointers though. Don't use the "List" feature of Houston. It's messy and memory heavy. Use a grid window, it works like a spreadsheet / HTML table. Same effect, cleaner. Also don't use the base skin Houston starts you out with. it clashes something awful, and looked terrible to begin with. People will judge your addon on the UI. I would like to see your code (You should set up a Git repo for it) to see if I can offer assistance. I love this idea! I hope it goes great! Thank you for the feedback, everyone! I have gotten it to a state where I feel comfortable releasing an alpha version of the addon, and not just sticking with closed testing. Please note that this is very much alpha addon and is prone to break. Thank you Togglebutton for the pointers. If I can get the proof of concept down, and a version 1.0 working, I will go forward with optimizing memory usage and interface. Please post what errors or oddities you find. I will be actively working on it, and will put it up on Curse when I feel it is stable enough. So, looking around, you're doing a lot of unessacary setup in the OnDocLoaded event. setting you flags (Better to call them CodeEnumFlags for consistence) can be done in the "new" method. Same thing with a the JSON package. Any addon variable can be setup there. That method should be used for stuff that can only be set with the UI created.